Living in an apartment and not having a crafting space has put a kink in my creativity. So many projects and no place to work. My husband is tired of my taking over the dinner table! No creative space = no creativity. We are fortunate to end 2016 better than we started. My hubby has a new job so we will be moving states again in the next couple of months. I am finally sitting down and dealing with my stored pics to set up several posts to cover the move and, hopefully, I will be blessed with a new craft room. First, we have to find a house! So, here is another shirt I made on the Cricut with iron-on vinyl. 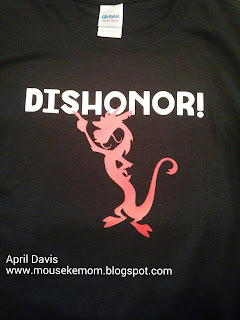 My daughter is a sassy, sarcastic teen and loves Disney characters with the same traits. She asked for a Mushu shirt to wear on our trip this past summer and here is what we came up with. She was stopped by several people during the trip to ask where she got the shirt. Her answer was "My mom made it!" She even got compliments from Disney cast members. I consider that high praise.